In 2015 an idea was raised to replace some old NSG signage in rural areas. 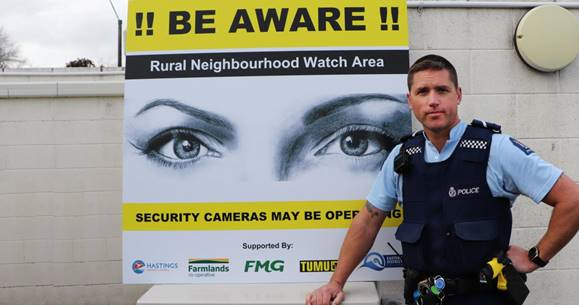 Police are praising local businesses in Hawke’s Bay for their proactive approach to crime prevention. The Bay’s businesses have taken a stand against burglaries, thefts, poaching, drug cultivation and boy racers affecting Hastings’ rural areas by investing in new signs warning potential offenders they are being watched. Following the decision to replace some ageing Neighbourhood Support Group (NSG) signs, local businesses were approached to become part of the new initiative. An action group was formed, and thanks to the support of local sponsors Farmlands, FMG Insurance, Tumu ITM, Hastings District Council, Gwen Maldon Trust, Zoar Trust and East Coast Rural Support Trust, the project has proved a major success. Senior Constable Greg Andrew credited the local businesses for their assistance throughout. “It could not have been achieved if not for their involvement and generosity to provide support around crime prevention into the local rural areas,” he said.